Whenever you sit down to write something, do you imagine how impactful it will be? Or how many eyes will read it? Well, did you know that 40 percent of your articles never get read? Yes, the one you slaved over and edited again and again. If you're lucky, about 60 percent of your articles will be read. But there are secrets to increase readership and give your posts some punch. Do you include images and video in your articles? Below, we've got some more facts about consumer reading habits, but we also have ways to combat these findings and advice on how to produce pieces your readers will love. We just can't say this enough. But are you royalty? Your content is what is going to establish you as a leader in the industry. It's what will make your customers want to keep coming back because you write what they like to read. When you're writing, content is at the forefront of your mind — as it should be. However, before you post, you need to really think about the organization of your material and the scroll bar on the side. 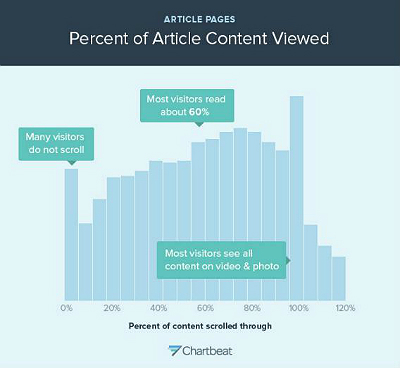 About 10 percent of people don't scroll through your article at all. You've got to showcase the most enticing information at the top of the page. Test it out, and see if you'd keep reading before you post. If you want your readers to be actively engaged in your content, which means reading the whole piece, you've got to include images and videos. Research shows 100 percent of readers will finish a piece that contains videos and images. Think about it: images and videos are far more inviting than huge blocks of text, and they take far less time to read. Perfect example: Buzzfeed boosts "social content," and a major chunk of their website is telling stories through captions on images and videos. They've found great success with this medium, which is why they constantly implement it. Give your readers what they want — and they want more memes, gifs, images and videos. Centuries ago, the greatest authors were the ones with the longer length and super-detailed descriptions, like Nathanial Hawthorne. Using more text doesn't work in the digital age. People no longer want to be told; they want to see. We have the technology (coupled with the short attention span), so use it. Storytelling is no longer about text; it's about utilizing videos and images with short phrases. More visuals and less text is the best chance of success for your business's story. Emma Fitzpatrick is an assistant account manager at Garden Media, a public relations firm that specializes in the lawn and garden industry. Emma received a degree in English from West Chester University.